Hempz BEACH BUD Instantly Bronze Tanning Lotion – 8.5 oz. We all know about tanning and tanning lotions but one of the big tanning lotions out there are hem tanning lotions. More and more tanning lotions out there today are starting to use hemp as an ingredient but what exactly is hemp? Hemp is a fiber (very durable) that is harvested from a plant or plants that come from the cannabis genus varieties and is cultivated for commercial use. With everything in our current economy and civilization turning green it looks like tanning lotions are now following the same trend. Hemp’s are harvested on small plots, the plants are normally cut a small distance above the soil (roughly 2 to 3 cm) and left to dry in older times this would be followed by a procedure known as retting (this is when the hemp is either floated in water or left outside for the dew to moisten it) but due to current advancements that step can be skipped out. The final step is the separation of fibers and this process is called thermo-mechanical pulping and normally down by steam using machines. Why is hemp so useful nowadays? Well hemp is useful because it is not only organic but fits into a lot of our different markets such as: food and nutrition, medicine, jewelry and other means. The reason it is so effective and widely used is because of some of its basic properties such as: food- the seeds of the hemp plant contain essential fatty and amino acids that are used to sustain human life and in medicine- the plant hemp produces a oil that has some anti-inflammatory properties (it stops swelling). 1. 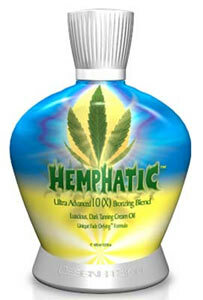 Hemp oil has very good properties such as hydrating properties (this is simply the wetness factor of this product), but why is having hydrating properties beneficial well since the tanning beds contain such high amounts of UV rays and that it will be set off in a close proximity to you the hydrating property of hemp tanning oil will keep your body moist and not let it get all flaky and dry. 2. Hemp oil also contains a chemical known as humectants (this is a chemical that has the ability to draw moisture from the air and lock it in the surface to which it is applied). This is a non oily substance and greatly helps the major property of hydration in the hemp tanning oil. 3. There are very few allergic reaction related to hemp oil around the world, and since one of the leading risks in tanning oil is persons allergic responses this should be a good choice, unless you are one of the unluckiest persons in the world then this would be a good product for you. 4. The oil also acts as an intensification factor for UV rays thus giving you a darker tan. Hemp tanning oil is one of the best tanning oils out there because of their good benefits and little to no drawbacks.